Our understanding of rock forming geological processes and thereby of geodynamic processes depends largely on a sound basis of knowledge of minerals. Due to the application of new analytical techniques, the number of newly discovered minerals increases steadily, and what used to be a simple mineral may have turned into a complex group. A continuous update is necessary, and the Reviews in Mineralogy and Geochemistry series excellently fulfills this requirement. The epidote minerals have not yet been covered and we felt that this gap should be filled. The epidote mineral group consists of important rock-forming minerals such as clinozoisite and epidote, geochemical important accessory minerals such as allanite, and minerals typical for rare bulk compositions such as hancockite. Zoisite, the orthorhombic polymorph of clinozoisite, is included here because of its strong structural and paragenetic similarity to the epidote minerals. Epidote minerals occur in a wide variety of rocks, from near-surface conditions up to high- and ultrahigh-pressure metamorphic rocks and as liquidus phases in magmatic systems. They can be regarded as the low-temperature and high-pressure equivalent of Ca-rich plagioclase, and thus are equally important as this feldspar for petrogenetic purposes. In addition, they belong to the most important Fe3+ bearing minerals, and give important information about the oxygen fugacity and the oxidation state of a rock. Last but not least, they can incorporate geochemically relevant minor and trace elements such as Sr, Pb, REE, V, and Mn. The epidote minerals are undoubtedly very important from a petrogenetic and geochemical point of view, and have received a lot of attention in the last years from several working groups in the field of experimental studies and spectroscopic work. As a result, the thermodynamic database of epidote minerals has been significantly enlarged during the last decade. Recent studies have revealed the importance of zoisite in subduction zone processes as a carrier of H2O and suggested zoisite to be the main H2O source in the pressure interval between about 2.0 and 3.0 GPa. Many studies have shown that an understanding of trace element geochemical processes in high-pressure rocks is impossible without understanding the geochemical influence of the epidote minerals. Recent advances in microanalytical techniques have also shown that epidote minerals record detailed information on their geological environment. W. A. Deer, R. A. Howie and J. Zussmann edited the last comprehensive review on this mineral group almost 20 years ago in 1986. In 1990, on the occasion of the 125th anniversary of the discovery of the famous Knappenwand locality in the Tauern/Austria, an epidote conference was held in Neukirchen/Austria organized by the Austrian Mineralogical Society by V. Höck and F. Koller. 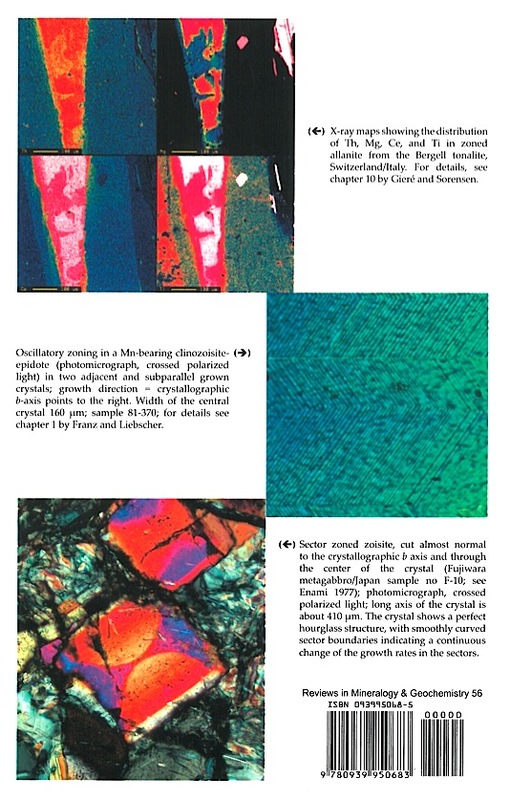 In 1999, there was a special symposium at the EUG 10 in Strasbourg, convened by R. Gieré and F. Oberli, entitled Recent advances in studies of the epidote group that highlighted the relevance of the epidote minerals for Earth science. However, there are many open questions in the community regarding the epidote minerals and there is a need for a new overview that brings together the recent knowledge on this interesting group of minerals. The present volume of the Reviews in Mineralogy and Geochemistry reviews the current state of knowledge on the epidote minerals with special emphasis on the advances that were made since the comprehensive review of Deer et al. (1986). We hope that it will serve to outline the open questions and direction of future research. In the Introduction, we review the structure, optical data and crystal chemistry of this mineral group, all of which form the basis for understanding much of the following material in the volume. In addition, we provide some information on special topics, such as morphology and growth, deformation behavior, and gemology. 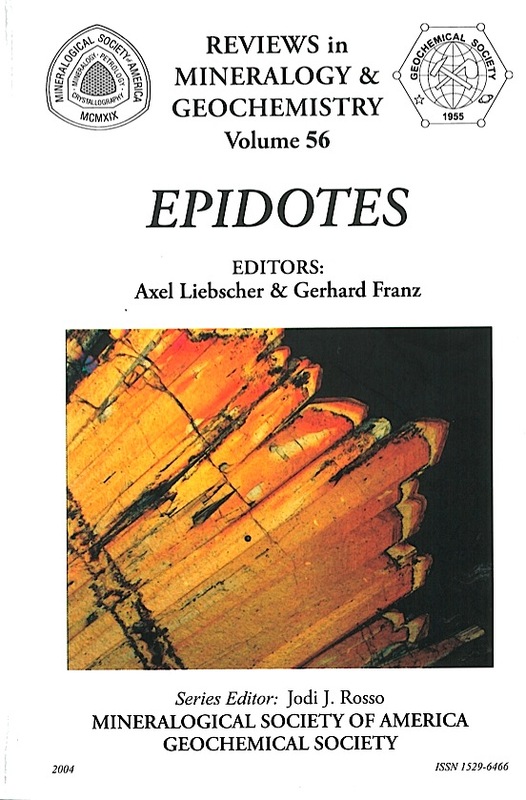 Thermodynamic properties (Chapter 2, Gottschalk), the spectroscopy of the epidote minerals (Chapter 3, Liebscher) and a review of the experimental studies (Chapter 4, Poli and Schmidt) constitute the first section of chapters. These fields are closely related, and all three chapters show the significant progress over the last years, but that some of the critical questions such as the problem of miscibility and miscibility gaps are still not completely solved. This section concludes with a review of fluid inclusion studies (Chapter 5, Klemd), a topic that turned out to be of large interest for petrogenetic interpretation, and leads to the description of natural epidote occurrences in the second section of the book. These following chapters review the geological environments of the epdiote minerals, from low temperature in geothermal fields (Chapter 6, Bird and Spieler), to common metamorphic rocks (Chapter 7, Grapes and Hoskin) and to high- and ultrahigh pressure (Chapter 8, Enami, Liou and Mattinson) and the magmatic regime (Chapter 9, Schmidt and Poli). Allanite (Chapter 10, Gieré and Sorensen) and piemontite (Chapter 11, Bonazzi and Menchetti), on which a large amount of information is now available, are reviewed in separate chapters. Finally trace element (Chapter 12, Frei, Liebscher, Franz and Dulski) and isotopic studies, both stable and radiogenic isotopes (Chapter 13, Morrison) are considered. We found it unavoidable that there is some overlap between individual chapters. This is an inherited problem in a mineral group such as the epidote minerals, which forms intensive solid solutions between the major components of rock forming minerals as well as with trace elements.